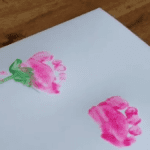 This DIY project is super easy, even for beginners! Whether you’ve got a wedding coming up or you’re just excited for the fall season, there are plenty of reasons to celebrate and decorate. Which is why we love these hula hoop wreaths. They make the perfect, festive additions to front doors, mantles and more, so prepare to get crafty! Hula hoop wreaths are not only inexpensive (as you may have a few around the house already), but they’re also easy to make. You definitely don’t have to be an expert DIY-er to get these done. You can get as creative with these as you’d like. Go the traditional route and adorn a hula hoop with fall flowers. Or spray paint the hula hoop gold and decorate the inside with your initials. No matter what you decide to do, the end result will be a beautiful wreath to display around your home or at an event — think birthdays, Halloween parties and more! There’s plenty of inspiration to be found online, as well as step-by-step instructions for how to create these wreaths. And as usual, Pinterest is a great place to start. Some burlap ribbon, faux flowers, greenery and a little hot glue was all I needed to transform this hula hoop into a beautiful display piece. You could easily hang something like this on your front door or in your bedroom. 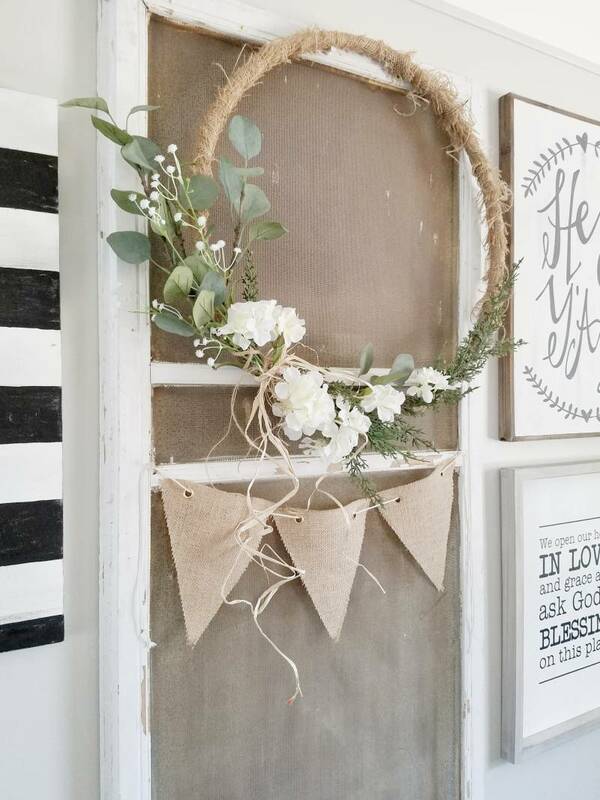 Follow along with the steps for how to complete this wreath on the All Things With Purpose blog. Use twine to create a web pattern in the center of a hula hoop and — tada! 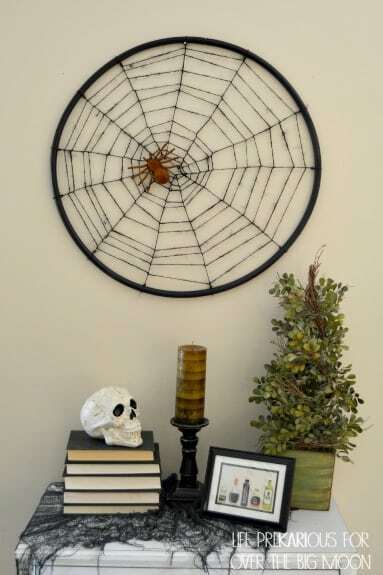 — you’ll be left with a spooky piece of decoration that will be perfect for your forthcoming Halloween party. 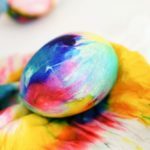 You can find the full tutorial on the Over The Big Moon blog. If you’re hosting Thanksgiving this year, you may be interested in making your dining space feel extra festive — and there’s no better way to do that than by hanging this wreath on your wall. 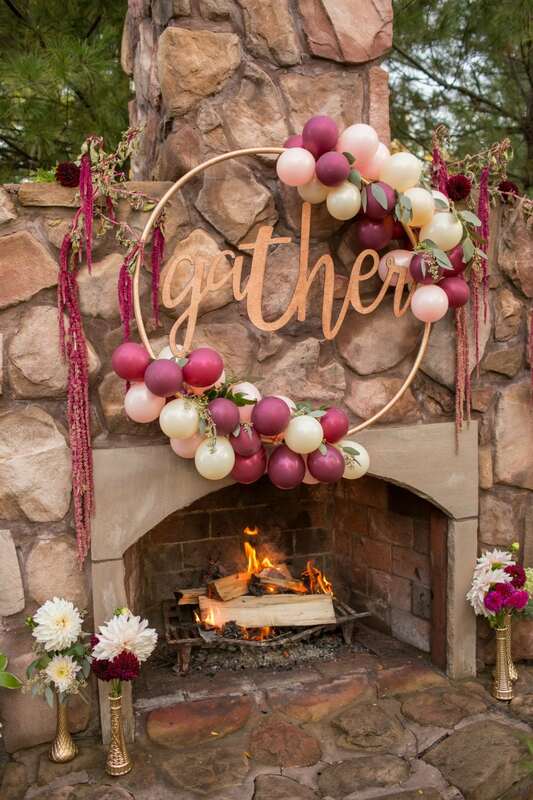 Balloon garland and a wooden “gather” sign really bring this piece to life. See the inspiration behind this wreath on the One Stylish Party website. Then find out how to DIY balloon garland on the Maison de Pax blog. 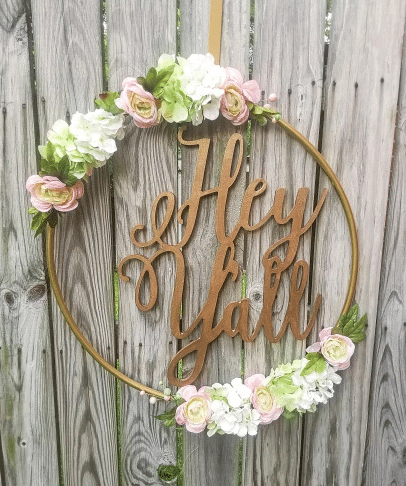 Something as simple as a “Hey Y’all” sign and some faux flowers and/or greenery can welcome guests to your home no matter the season. Since this can be left on your front door all year long, it’s definitely worth the minimal amount of effort it takes to create it! Check out the Wonderful Creations Blog for details. To make your home feel a little extra special come Christmastime, consider using classic elements such as twine, eucalyptus and wooden letters to decorate a golden hula hoop. 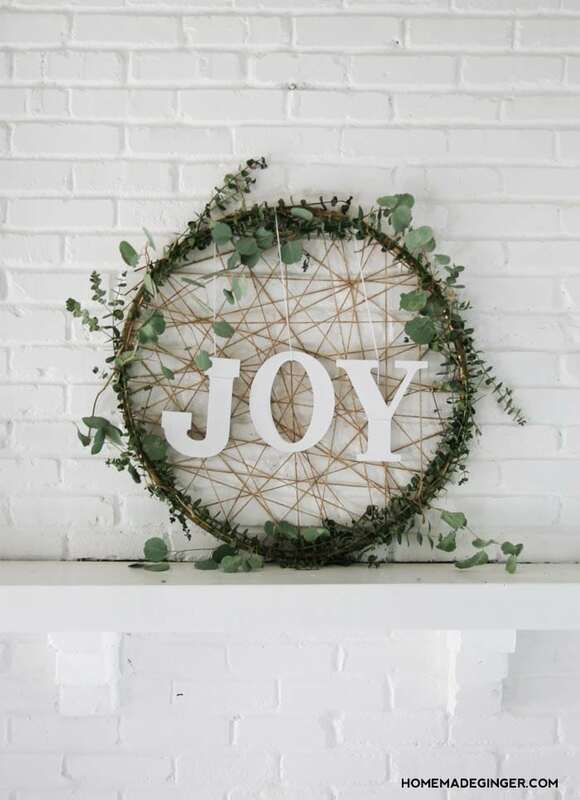 Using the letters to spell “joy” makes the wreath even more festive. 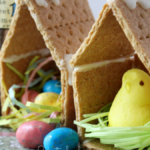 See how it’s done on the Homemade Ginger website. 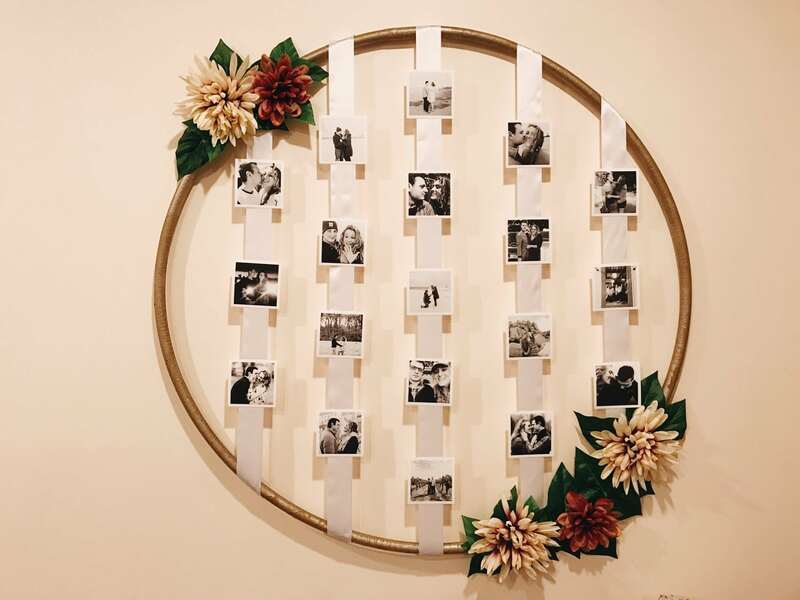 Using photos to decorate the inside of a hula hoop is a surprisingly chic way to announce a pregnancy, celebrate a wedding and so much more. Plus, a hula hoop, some ribbon, flowers and photos are all you really need to make it! See a tutorial on the Photos by Alexandria website. Which hula hoop wreath will you make?